Firefighters extinguished a fire that broke out Saturday evening at a high school gymnasium in Belmont. According to Belmont city officials, at 5:55 p.m. Belmont police and firefighters responded to a report of smoke coming from the roof of the gym at Carlmont High School at 1400 Alameda de las Pulgas. When crews arrived they found smoke coming from the gym's roof above the area of the boy's locker room. About 50 people who were attending the playoffs for an adult basketball league were evacuated from the main gym. There were no injuries, city officials said. Belmont firefighters attacked the two-alarm blaze. They were assisted by crews from the San Mateo, Foster City and Redwood City Fire Departments, as well as Cal Fire. Crews remained on the scene for about three hours to ensure the fire was out and did not spread to other parts of the building. According to city officials, the main portion of the gym was not affected by the fire, however the fire did cause about $100,000 in damage to the boy's locker room area. The cause of the blaze is under investigation. 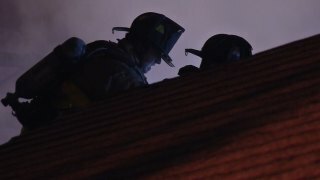 Fire officials are looking into a possible connection to roofing work that was done on the building earlier in the day, city officials said.